It's 2020, and the extraterrestrial SE (it stands for "Space Emigrants") have invaded and taken over the Earth. The human race retreats to underwater cities, but with the SE's high technology, it looks like the human race is finished for good. But what's that? Now, a century later it seems that the human race may finally have found a way to strike fear in the hearts of the SE and fight back...do they have a chance after all? It's sad that there are still people in Japan who are stupid enough to let Ohbari Masami sit in a director's chair. You see, Voogie's Angel, despite Ohbari's involvement, had the potential to be a cute, fluffy show, which in places, it is. Unfortunately, two-thirds of this series is mired in directorial and screenwriting stupidity that borders on the surreal. Put simply, 67% of Voogie's Angel really, really stinks! Why, you ask? Well, the premise itself is admittedly shaky, what with the last refuge of humans being on the largely inhospitable seafloor. And apparently, these last bastions of mankind must be anchored so that they don't float (wait a second, why would an underwater city float and where the heck are they getting their so-called "necessary supplies" anyway?). We have these androids/cyborgs/whatever who are "the last hope" of mankind, and they're incompetent, whiny nincompoops. Oh yeah. Couple that with an equally inept human military with no practical knowledge of strategy OR tactics (yeah, let's all attack this island from the same angle so that we ALL get wiped out by one energy blast!) and we have an anime that is so poorly written that the best joke they can come up with is, "It's a bird! It's a plane! No, it's ... a PIG!" Hardy har har. I'm falling out of my seat. And then Voogie's Angel lets loose a blast that destroys the Big Bad Satellite Cannon in the Sky, and promptly crash-lands their piggy-mech, which the girls jiggle and bounce and bicker and quarrel, and the audience slaps their collective forehead in shame for having rented this. Then there's the next episode, featuring more scenes of the stunningly inept human military - gee, let's fly our ENTIRE Air Force in the crosshairs of this cannon and have the only survivor have a momentary angst scene and crash into the cannon just like that drunkard in Independence Day! - and even more scenes displaying the incompetence of Voogie's Angel, and it all ends on a cliffhanger as they (predictably) get captured by the Bad Guys. Of course, now it's time for the other director, Aoi, to kick Ohbari out of the seat and try to rescue this thing from a one-star grade. Thank goodness, right? Well, halfway through the first episode, we are given hints of the Angels' real identities as "not-entirely-humans" (gee, what a shock) and it was Dave who said, "Don't tell me they're going to go for a self-realization plotline with this thing!" And so they did. Thankfully, it isn't utterly disastrous, as director Aoi does a halfway competent job of roping us back in and making us even remotely interested about the backgrounds of these girls. In the end, the Angels win the day (for now), and head home, hopefully a little wiser and smarter than before. And that's it. No more, unless you are willing to import radio dramas from Japan. And sure, they're probably better than the anime series, but I doubt anyone will be quite that fanatical over this rather lightweight, stupid show. Technically, it's pretty bad. Yeah, there's some gloss to the girls, as it's an Ohbari film (and thank goodness they toned down the original character designs!) ... but the animation itself is lousy and low-budget. The music, apart from the serviceably catchy opening theme ("motto motto radical fight! "), is atrociously kitschy synthesizer crap, ripping off badly from various movies here and there, and with only one BGM of note (during the fake samurai drama Voogie is watching at the beginning of the show, which is actually rather funny). The ending song for the first episode is truly remarkably -horrible-, with lyrics that can best be described as something a twelve-year-old would dedicate to her crush. Finally, the star-studded cast list (the main girls being played by Hisakawa Aya, Mitsuishi Kotono, Inoue Kikuko, and Kikuchi Shiho) offers more proof that Japanese voice actors will do anything as long as they're paid. 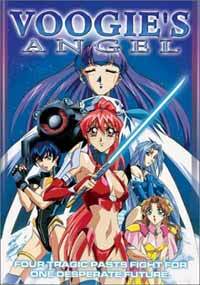 Virtually all of the Voogie's Angel team is played by a superstar, which makes this failure of an anime ... even MORE of a failure than if they'd cast a whole lot of nobodies. You get the feeling that even if the creator had taken this whole thing seriously to begin with, the direction would only emphasize just how -awful- the writing is. Oh well. But wait, these voice actresses should be able to give us memorable characters, right? No WAY! Voogie has a severe case of ADHD - and she's supposed to be the leader. Rebecca is pointlessly gunhappy, Shiori is practically a non-factor, and Merrybell is so incredibly annoying that the entire audience yelled, "Just shoot her" within ten seconds of hearing her abominably squeaky voice. And the "voice of reason" Midi pretty much was relegated to shaking her head in shame (much like anyone in the audience who isn't being distracted by bouncing boobies). It could've been worse, though. It could've been Six Angels. While the whole thing can be looked at as self-parody, the truth of the matter is that apart from the serious third episode, Voogie's Angel is simply not that good, and really ought to be left on the shelf unless you're well and truly desperate for pointlessly jiggly, skimpily-clad girls who act like spoiled children. Personally, I'd rather eat an entire can of Spam in a sitting than have to watch this again. Hickory Smoke flavor, mmm. Recommended Audience: This is the kind of show only a fanboy (or specially oriented fangirl) could love. We have dumb girls parading about in skimpy outfits, occasionally subjected to some rather brutal violence and torture at the hands of the bad guys. A couple of bloody scenes here, too, leading to an "older teens and up" recommendation. Big surprise here.